Fulcrum Push-Ups: The Best Chest Exercise? Are fulcrum push-ups the best chest exercise? The major muscle group of the chest is the pectoralis major, or ‘pecs.’ To understand why fulcrum push-ups might be the best chest exercise, let’s take a look at the biomechanics of this muscle group. The pectoralis has two heads: The clavicular head, which originates on the front of the clavicle or collar bone, and inserts on the upper arm, and the much larger sternocostal head, which originates on the sternum and ribs, and inserts on the upper arm. 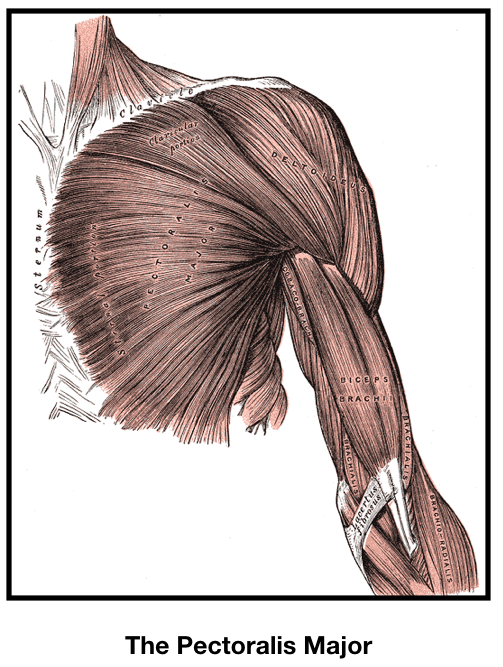 The primary action of the pectoralis major is adduction of the humerus, i.e. draws the arm toward the centerline of the body. The pectorals enable us to hug something or someone tightly to our body. The pecs also internally rotate the arm. The clavicular head – often called the upper pec – also flexes the arm, that is, draws the arm toward the clavicle. We perform arm flexion and activate the “upper pecs” i.e. the clavicular head of the pecs in all types of push ups, dips, and bench presses. I want to repeat that. Push ups, dips, and flat, incline and decline bench presses ALL involve arm flexion, and all activate the upper pecs. In fact, some EMG studies indicate that decline and flat bench presses activate the clavicular head of the pecs MORE strongly than do incline presses. This means you can effectively train all heads of the pecs with just one exercise. The best chest exercise will involve arm adduction, flexion, and internal rotation. An understanding of human evolution can help us identify the best chest exercise. Human anatomy and physiology only make sense when we consider natural selection. The pectoralis muscles we have today function the way they do because they helped our ancestors survive and reproduce in their natural habitat. We have to think about what our ancestors had to do to survive in order to understand why the pecs work the way they do and what might be the best chest exercise. It should go without saying that our ancestors did not have to be good at bench pressing or anything like it in order to thrive in our ancestral environment. Our ancestors did not have to win bench press contests in order to survive and reproduce. But our ancestors did have to do push-ups as a regular part of their daily survival tasks. They slept on the ground and when they got up in the morning, they would use their pecs to push themselves up off the ground. If they fell down, or had to crawl on the ground for any purpose, they would use their pectorals to push up or hold themselves up. If they had to climb over a ledge or up a tree, the pectoralis would be used to push up. Watch young children playing games outdoors and you will likely see them perform dozens of push ups getting up off the ground after falling. All this suggests that the best chest exercise might be some form of push-up or dipping movement. Compared to push-ups and dips, bench pressing has a major drawback, that being that when lying on your back with a heavy weight in your hands, your scapulae are not able to move as freely as they would when doing a push up or dips. This may limit your ability to protract your scapulae under the influence of the pectoralis, limiting the training effect for the pecs. In addition, bench pressing can be dangerous. Some people have been severely injured or even died when they dropped the barbell or dumbbell on themselves when unable to control it under fatigue. You can’t get trapped under or drop a heavy dumbbell on your head, neck, or chest when doing push-ups or dips. The danger involved in bench pressing makes it doubtful that it is the best chest exercise. I will discuss below why elastic bands such as Bodylastics are an ideal way to load push-ups. Push-ups Vs. Dips: Which is the best chest exercise? So, of dips and push ups, which is best for the pecs? I believe that the push-up best activates the functions of the pecs. Unless you do dips the way Vince Gironda advocated, bar dips activate primarily the shoulder flexion function of the pectorals, and neglect the arm adduction function, i.e. drawing the arm toward the sternum. In contrast, push-ups involve both arm flexion and arm adduction, especially if you perform them on rings (which makes them more like dumbbell bench presses). Every time you do a push up, your arm moves toward both the sternum and the clavicle. At the beginning of a push-up, your body alignment relative to your arms is similar to a decline bench press. When you lower your body, the alignment is more like that of a flat bench press. When you press up, the arm moves towards the collar bone, as in an incline press. If you do them on rings, you then draw the arm toward the centerline, fully contracting the pecs. Therefore, the push-up strongly activates both the sternocostal and clavicular heads of the pectoralis. In other words, the push-up combines the actions of the incline, flat and decline bench press all in one exercise. The pecs were designed by evolution to perform push ups. The fulcrum push up is one of the several special exercises promoted by classic bodybuilder and coach Vince Gironda, improves on the conventional push up. In the video above it is performed by Daryl Conant, a long-time student of Gironda. In the fulcrum push-up, you have your feet and hands on three benches all of the same height. From the top, you bend your legs as you ease into the bottom position, which increases the stress on the lower fibers of the pecs compared to a regular push up. Basically, this exercise combines push-ups with dips, increasing the range of motion for the pecs. I’ve improved on the basic fulcrum push-up by doing it on rings, which increases the range of motion of arm adduction, and by using Bodylastics bands to add resistance. To set up what might be the best chest exercise, you hang the rings so that the place where you will grip is at about the same height off the floor as the top of the bench you will place your feet upon. When you get into the support position, you bring the rings together so that they touch or come close to touching. When you lower yourself into the bottom stretched position, you bend your legs and let the rings come apart. Pause briefly in the stretched position, then smoothly press up and simultaneously smoothly draw your hands to the centerline while internally rotating the arm. This may be the best chest exercise because it combines arm flexion, adduction and internal rotation, working the whole pectorals, both the sternocostal and clavicular heads through a full range of motion, and it is impossible to get trapped. It is a complete and very safe pectoral exercise. I have increased the load I use in fulcrum ring push-ups by loading plates on a dowel attached to my Brute Belt, as I described in the video below. However, I prefer using my Bodylastics bands to plates to load push-ups, because when you do push ups, as you press up from the bottom to the top your leverage improves. This means you can handle more resistance at the top of the motion than at the bottom. Elastic bands increase in resistance as they stretch, so they are ideal for adding resistance to push ups. When I use bands and rings for these push-ups, the contraction in the pectorals at the top of the motion is very intense, much greater than when I use plates to load push ups. I consider the band-resisted fulcrum push-up on rings the best chest exercise for bodybuilding, and it is my main chest exercise. If you are looking for a very safe and very effective chest exercise, consider adding band-resisted fulcrum push-ups on rings to your bodybuilding and strength training routine.